모시는 오랜 기간동안 이용되어 온 직물로서 일명 저포·저치라고도 하며, 모시나무가지를 꺾어 그 껍질을 벗긴 것을 재료로 한다. 통일신라 경문왕(재위 861∼875) 때 당나라에 보낸 기록으로 보아 외국과의 교역품으로 이용되었음을 짐작할 수 있다. 모시풀은 다년생으로 뿌리쪽 줄기가 황갈색으로 변하며, 밑의 잎이 시들어 마를 때 수확한다. 보통 1년에 3번 정도 수확하는데 5월∼6월초, 8월초∼8월하순, 10월초∼10월하순이며 두번째 수확한 모시가 품질이 제일 좋다. 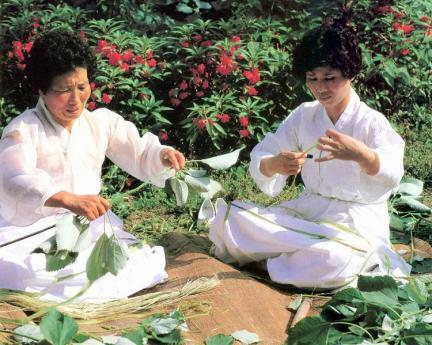 한산모시는 한산에서 만드는 모시로 예로부터 다른 지역에 비해서 품질이 우수하며 섬세하고 단아하여 모시의 대명사로 불리어 왔다. 제작과정은 재배와 수확, 태모시 만들기, 모시째기, 모시삼기, 모시굿 만들기, 모시날기, 모시매기, 모시짜기, 모시표백 순이다. 우선 재배하여 수확한 모시를 훑고 겉껍질을 벗겨 태모시를 만든 다음 하루쯤 물에 담가 말린 후 이를 다시 물에 적셔 실의 올을 하나하나 쪼갠다. 이것을 모시째기라고 한다. 쪼갠 모시올을 이어 실을 만드는데, 이 과정을 모시삼기라 한다. 이 모시삼기의 과정은 실의 균일도가 가름되는 과정으로 한산의 모시삼기기술은 우수하여 균일도가 일정하다. 이렇게 하여 만들어진 실을 체에 일정한 크기로 서려 담아 노끈으로 열 십(十)자로 담아 모시굿을 만든다. 모시날기는 실의 굵기에 의해 한 폭에 몇 올이 들어갈지 결정하는 것이다. 모시매기인 풀먹이기 과정을 거친 후 베틀을 이용해 모시를 짠다. 마지막으로 모시표백은 물에 적셔 햇빛에 여러 번 말려 백저포, 곧 흰 모시가 된다. 모시는 보통 7새에서 15새(보름새)까지 있는데 10새 이상을 세모시라 하고 숫자가 높을수록 고운 최상품으로 여긴다. 1새는 30㎝ 포폭에 80올의 날실로 짜여진 것이다. 모시는 습도가 모자라면 끊어지기 쉬우므로 더위에도 통풍이 안되는 움집에서 짜야 하고, 바람이 불거나 비오는 날에는 일을 할 수가 없다. 근래에는 염소표백을 하여 흰 모시를 만들기도 하며, 섬유공업의 발달과 함께 수요가 줄어들어서 이 지방의 모시짜기 기술도 점차 쇠퇴하고 있다. 한산모시는 우리나라의 미를 상징하는 여름 전통옷감으로 역사적 가치가 높아 제작기술을 보호하고자 국가무형문화재로 지정했다. 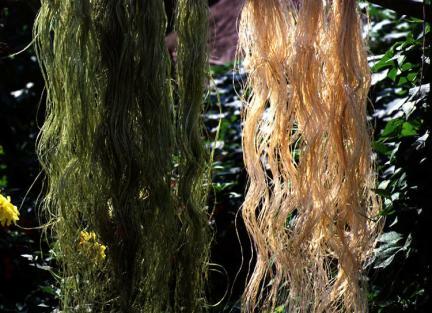 As textile traditionally made in the country, mosi (fine ramie) is made of the outer skin of ramie plant stalks. 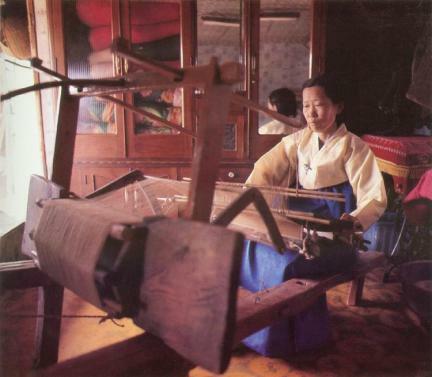 A record made during the reign of King Gyeongmun (r. 861-875) of Unified Silla makes us assume that it was sold to neighboring countries. Ramie plant is a perennial plant. 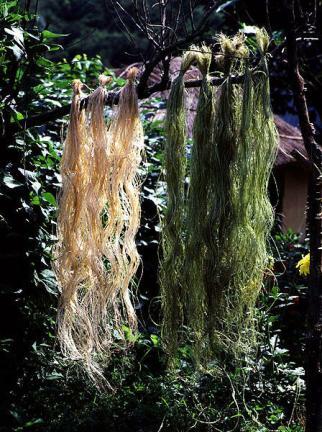 The stalks close to the root are harvested when they turn yellowish brown and the leaves at the bottom are withered. They are harvested three times a year, i.e., between May and early June, between early August and late August, and between early October and late October. Those harvested between early August and late August are the best in terms of quality. 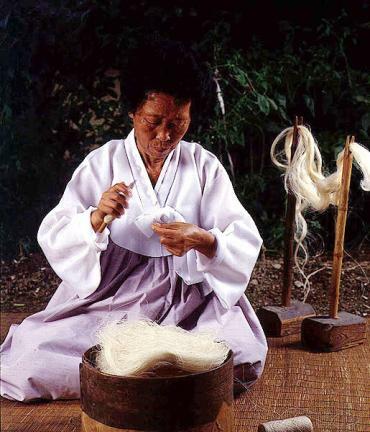 Fine ramie produced in Hansan is far better than that produced in other areas in terms of quality and exquisiteness. 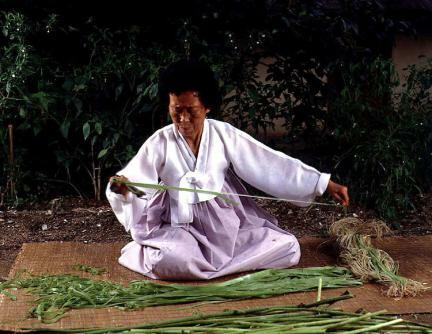 Thus, fine ramie of Hansan has been regarded as synonymous with fine ramie in this country. 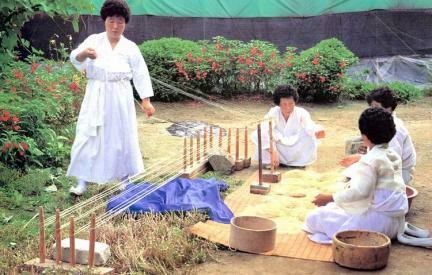 Fine ramie is produced as follows: first of all, the outer skin is peeled from the harvested stalks; the peeled off skin is soaked in water for about a day and dried; then it is soaked again in water; strands of split ramie pieces are made into threads, and this process of making threads decides the thickness uniformity of threads. 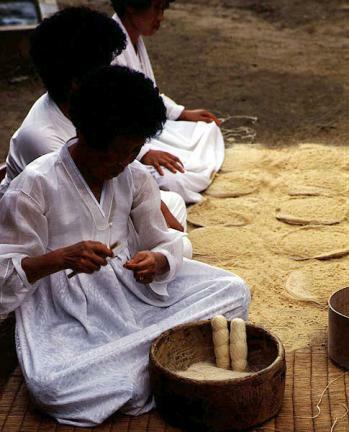 Products of Hansan are known for exquisiteness and thickness uniformity. 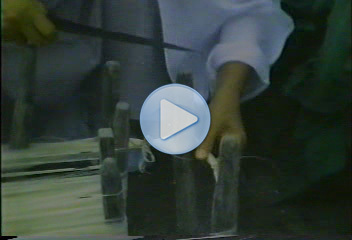 The thickness of threads decides how many strands are to be put into a given space. 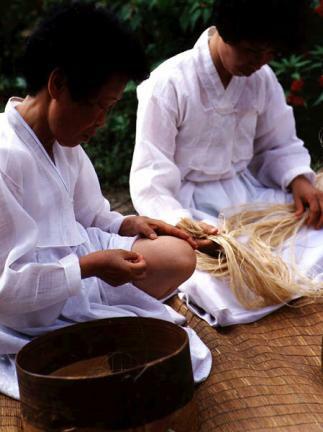 The threads are starched, and then ramie is woven with a weaving machine. 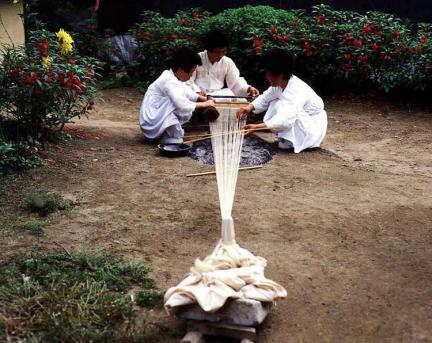 White ramie fabric is made through the process of bleaching based on the repeated process of soaking ramie fabric and then drying it in the sun. 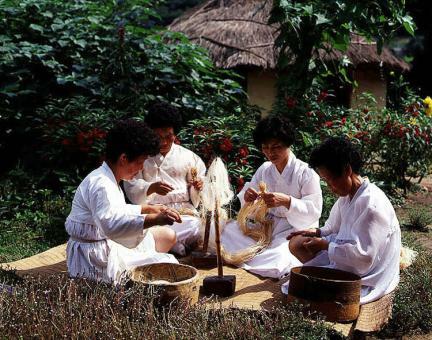 Ramie fabric is usually divided into 7 sae through 15 sae. 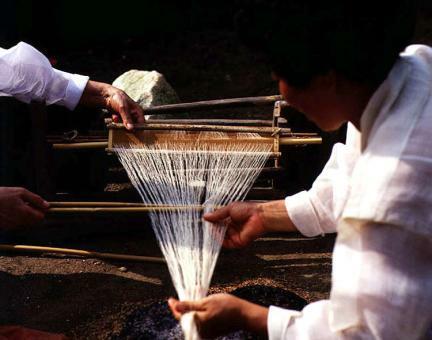 One sae refers to 80 warp threads woven into a 30cm wide cloth. 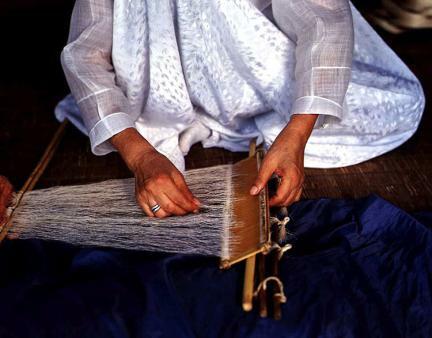 A cloth with 10 sae or more is called semosi (finely woven ramie). 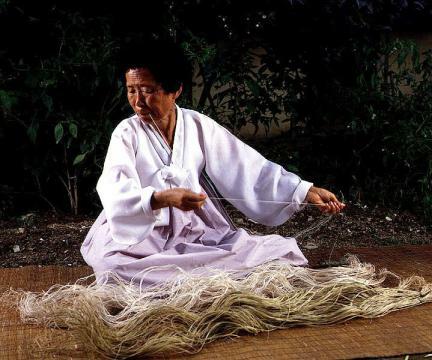 Ramie cloth is easily broken in a space with insufficient humidity. 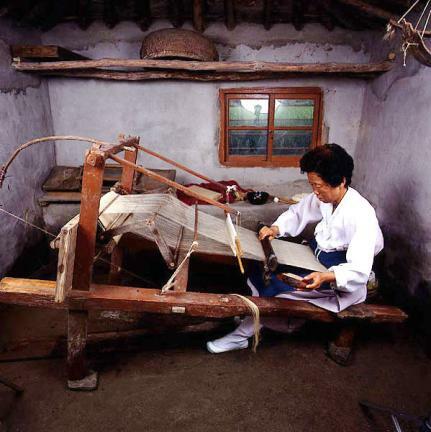 Thus, ramie weavers should work in unventilated space even in summer. 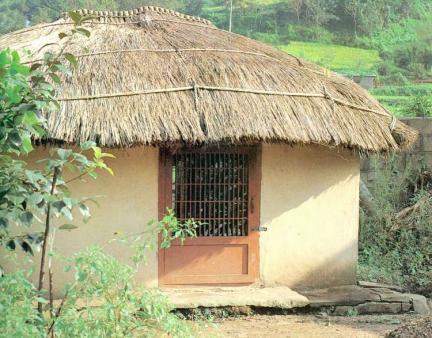 They cannot work on a windy or a rainy day. 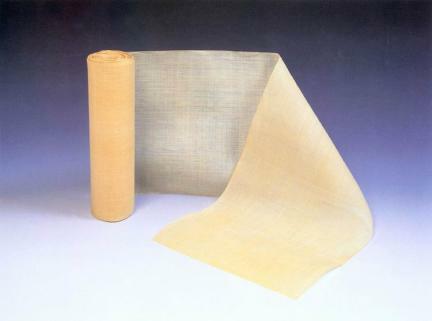 Nowadays, however, white ramie fabric is made by means of chlorine bleaching. 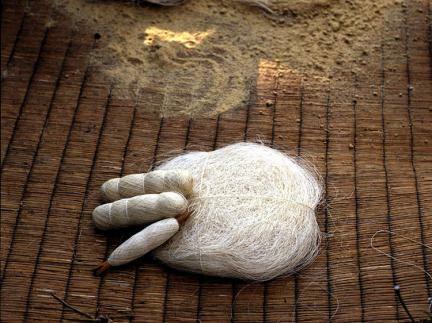 The relevant industry is on the decline with the development of modern textile technology. 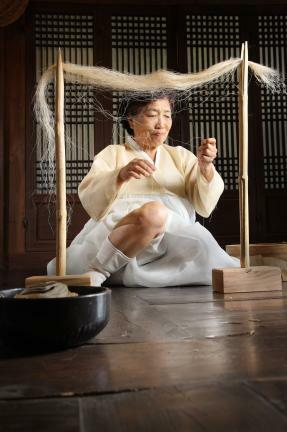 Fine Ramie Weaving of Hansan has been designated as important intangible cultural heritage to maintain the production skills considering its historical value as material for traditional summer clothes, symbolizing the country’s esthetic quality.